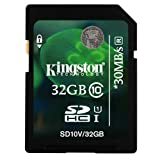 Fast Speeds to Capture HD Video Kingston’s SDHC/SDXC Class 10 UHS-I card is designed to be fast, with reduced buffer time between shots, making it ideal for cinema-quality full HD video and 3D video. It’s available in multiple capacities up to 128 GB, to provide plenty of space for HD videos and hi-res photos and it’s tested to be durable, so you can take it anywhere with confidence that your photos, videos and other data will be protected, even in harsh or unstable conditions. This entry was posted in Discount Photography and tagged 1200D, 32GB, Camera, Canon, Card, Class, Kingston, Memory, SDHC by Ball Photo. Bookmark the permalink.